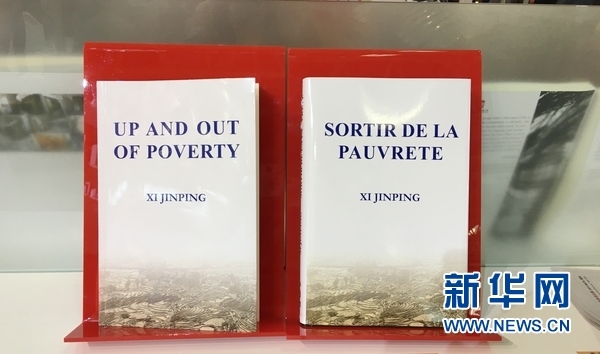 BEIJING, Aug. 23 (Xinhua) -- The English and French editions of Chinese President Xi Jinping's book on poverty relief were launched on Wednesday at the ongoing 24th Beijing International Book Fair. Titled "Up and Out of Poverty," the book is comprised of 29 of Xi's speeches and articles, as well as photos, from 1988 to 1990 when he was the Party chief of Ningde City in east China's Fujian Province. The Chinese edition was first published in July 1992 and reprinted in August 2014, gaining popularity among domestic readers especially officials at all levels. The foreign editions were translated and published by the Foreign Languages Press affiliated with China Foreign Languages Publishing Administration. Wu Shangzhi, deputy head of the State Administration of Press, Publication, Radio, Film and Television, said that the Communist Party of China Central Committee, with Xi as the core, regards poverty relief as a bottom line and benchmark for accomplishing the building of a moderately prosperous society. China's experiences will provide reference for other countries to shake off poverty, Wu said. The foreign editions have received high attention and won praise from political figures, academics and media in African countries.